There are different types of thinking needed to understand and make things better, usually done by doing one then the next in order. 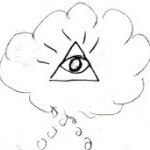 Different Ideas: As many ideas as possible, sometimes brain storming, other times playing the devil's advocate. It is a discipline that can save us from making huge mistakes when our emotions have already taken sides. Finding How Things Relate: Among the many ideas, looking at potential relationships then choose which seem to be most fruitful: the few that matter. Cutting what can't be, aka critical thinking. AND, Two ways to try and understand. Hint: #2 is usually better. In its worst form, shooting from the hip. Elegantly simple visuals can help with each. For instance, a mind map, or a Fishbone Diagram for generating different ideas, or the concept map, or an affinity diagram for finding relationships. Matrix Diagram for finding and cutting what is least likely, a Pareto to help you decide. Flow charts and traffic diagrams to bring it all together into a theory that makes sense and can be tested. 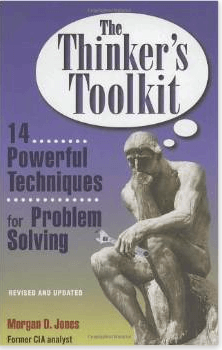 The Thinkers Toolkit: 14 Powerful Techniques for Problem Solving. A most important book on Thinking Tools by a former SPY!!! A must read if you want to stop hurting innocent bystanders as you shoot from the hip!